The following are actual comments that I have received. Received the tender castings and water bottom in great shape. Checked it all out, very nice work on the castings. I am very pleased with them. You have been very fortunate to find foundries to do this good of work. The wheel castings arrived about a week ago & look just the same, nice castings; many thanks for sending. Received everything today, the truck drawing and the package with the tender step and the two booklets. It all came through in real good shape. The tender step is a very nice casting. It will need only a little filing for cleanup. I had thought of fabricating the one missing on my tender, but having an original casting is much better. Enjoying reading Lester Friend's booklets on the B & A tanker and the Atlantic engines. He has a lot of good information in them. Received the castings today in great shape. I am very impressed with the quality of the castings. You are very fortunate to have found a place that can do this good of casting work. The Tom Thumb wheel castings are fantastic! Thank you for making these castings available. John, thanks for the castings. Once again these are awesome to work with! Thanks! The 1" scale drive wheel for the H.J. Coventry TEN WHEELER. Rough casting by Friends Models. Machining and photo by Jarvis Arp. See his comments, above. Just to let you know, I recieved both packages, but did not arrive together. Just a note to let you know I received the waterbottom casting this morning. All I can say is "WOW". What a hunk of bronze! Thanks for your service in keeping the 3/4" scale products alive. Subject: Re: The castings are here! Made time to open the box and look at the castings this morning. They are absolutely beautiful. 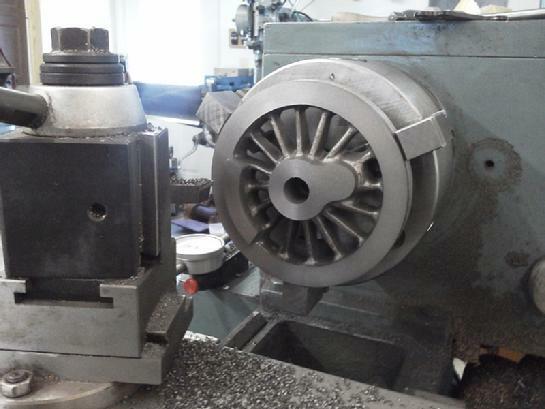 The P7 cylinder* solves many problems machining the valve bore. Kozo's castings are very tempting but I will save them for my son in law. Have decided to press on with the switcher, having a lot of fun with it, and maybe someday if I am lucky I will see it run. You can be sure that I will buy either the B&A 4-6-6 or the friends Atlantic, which ever you make first. Thanks for all the beautiful photos of the trip to Ted's. All I can say is "amen" to the good things you said about him. He, like you, was always a pleasure to deal with. Thanks very much for all you do for all of us. Please let me know as soon as you start work on either the tank engine or the Atlantic. Good health to all and my best wishes to everyone. John, The wheels arrived today. Don't know when I will machines them but the castings do look very nice. I look forward to ordering other castings from you in the future. Thanks. Received the castings yesterday and they are great. I especially like the tender casting, it is one beautiful piece of work. I have not ordered from Friend's before, and learned of them through this forum; IMHO this alone makes this group a gem! I HIGHLY recommend the wheel castings from Friends Models for building the Kozo New Shay. Anything ordered from John at Friends Models is SUPERB!!!!! Finally had time to start machining the Kozo wheel castings you sent. They are now ready for the final steps of wheel and flange machining. What a pleasure to work with the castings! Received the 4 drivers today. Neighbors ( retired machinists etc) are impressed with the fineness of the castings. The cylinder castings (3/4" scale USRA 0-6-0) came, along with the much appreciated extras, and they are all superb. The cylinders are exquisite. Finest castings I've ever seen. John H., a builder of the 3/4" scale USRA 0-6-0 from Colorado USA, says that these cylinders are the finest quality castings he has EVER SEEN. Keith Taylor, a former Brotherhood of Live Steamers Secretary (and a fan of the designs of HJ Coventry), says these cylinders are as good as ANYTHING Mr. Coventry ever sold. His comments may be seen below. Please join the Friends Models' Email list for product news; castings updates; and more! Please enter your e-mail address to join the E-mail list. You may unsubscribe at any time. The castings arrived this afternoon; they are beautiful. Thank you very much. Work is continuing on the brake rigging and suspension of the engine. I will start on the main frames soon. I will send an order for more castings soon. Thank you once again for the wheel castings and also, thank you for making this beautiful engine available again. (Comments from a customer after he ordered, and received, the 3/4" scale USRA 0-6-0 wheel castings). 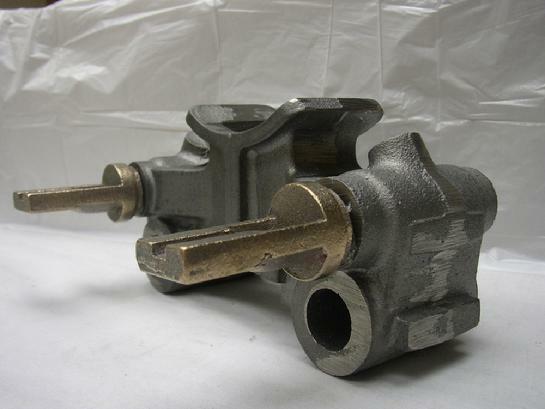 I wanted to compliment you on the fine wheel castings you provided to Jim C. I am his machinest and am very impressed with the accuracy of your castings, and the high quality of the cast iron. I will be sure to recomend your castings to others, and hope to one day build one of your models. I went to the web site and the cylinders for the 0-6-0 are gorgeous! They are absolutely every bit as nice as anything HJC (H.J. Coventry) ever sold! They should be a dream to machine, and you will end up with something superb, and not �fake� piston valves. I sure hope folks wise up and start supporting you before you get fed up and quit. I just purchased some of the 0-6-0 castings from John at Friends Models and they are superb. He is getting more and more castings available for it and I am certain they will be equal to these. They are well worth the money and will make for a beautiful steamer. Please pass this along in your next issue. John, these castings are BETTER than the ones I bought from Mr. Coventry in 1969. 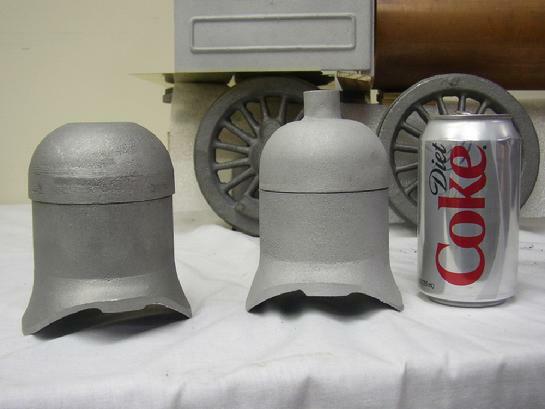 And...the addition of the chucking spigots to the dome castings are sure a welcome addition to the casting. When I did mine, there was no spigot and I had to turn a wooden holder, ram the dome into it, do my machining, turn it down on the outside, bore my steps on the inside, and then get it out of the holder. That little spigot thing you've added is going to be a joy for people. And your cast iron....beautiful. It's BETTER than what Coventry sold me; it's better iron and it's more cleanly cast. He would be proud that you're carrying this on for him, and doing it so well. In 1969, Clint B. received a dome from H.J. Coventry such as the one shown here on the left. In 2007, Friends Yankee Shop Models will supply you with the one on the right. Summer, 2007: The new magazine HOME RAILWAY JOURNAL has published a review of Friends Yankee Shop Models' castings for the 1" scale 4-4-0. Click the link below, to read the review. About once per month, Friends Yankee Shop Models sends out an e-mail to the subscribers on its "E-mail Updates" list. The e-mails include general information about Friends' current activities, plus: product updates, announcements of special sales, and other items of interest. It is a great way to stay abreast of Friends' activities, and to get the information direct from the source.....Friends! For more information, or to sign up for the e-mails, please click HERE.